I was speaking with a casting director (who will remain unnamed for now) the other day about ‘Thank You’ Cards in our industry. We discussed the reasoning behind this, and it became very clear that these can be important. Most of all it boils down to the simplest of all mannerisms… being polite. Yes, something that most of us do everyday: opening doors for people, saying “please”, even saying “bless you.” Although, I’ve easily seen actors skip this step when it comes to the audition process: Do you greet everyone with a smile and hello? Are you patient, even if you got there early and you’ve been waiting a while? 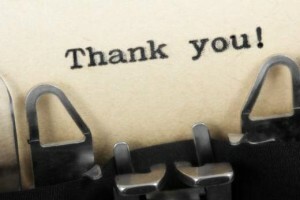 Do you thank your reader? Did you acknowledge everyone in the room? These are all simple things to think about. [on top of remembering our sides, getting into character, and taking adjustments, etc. ] With some practice, you can do these simple things and the weird part about it is – PEOPLE NOTICE! It’s as simple as being polite and giving it your best shot. This just increases your chance of the producers and casting directors rooting for you to do the great job they are looking for. ‘Thank You’ cards can go a long way with this process as well. Sending cards not only acknowledges that you are thankful for being given the opportunity to audition, but also reminds the casting director of your name and face (which can really come in handy later.) It also lets them know that you took the time to send this and that you would like to work for them in the future as well. Don’t break the bank on these. Just sending something with your picture and saying “Thank You” is enough. This will also help you keep the casting director in your files. Next time you audition or do mailings, you can remind that person of the work you have done since auditioning for the role. Remember, this industry is built on relationships. Being polite and sending cards are just a means to help strengthen them.